FA CUP DRAW: Westley paying little attention to the fourth round draw for now! Posh striker Aaron Mclean in action in an FA Cup tie at West Brom in 2009. Peterborough United manager Graham Westley has already put the FA Cup fourth round draw to the back of his mind. Posh were handed a disppointing tie away to Premier League West Brom or Championship side Bristol City in last night’s (January 11) draw. Those teams replay at Ashton Gate next Tuesday (January 19). Westley was at a game last night and missed the draw. He insists he has more pressing matters to consider before contemplating the opportunity to steer Posh into the fifth round for the first time in 30 years. Westley said: “When I know who we are playing I will give it some more thought, but until then I will concentrate on our League One form. The draw is what it is, we can’t change it, and we will try and find a way to beat whichever team we end up competing against. I will try and get to the replay next week to see what we could be up against. “Either opponent would be tough and it goes without saying that we would have preferred a home draw. Posh were the second team to emerge in last night’s draw and the tie will be seen as a huge anti-climax for a club who have reached the fourth round for the first time since the 2007-08 season. Co-incidentally Posh were knocked out by West Brom on that occasion. The Baggies were a top Championship club back then and eased to a 3-0 win at London Road against Darren Ferguson’s promotion-chasing League Two team. If West Brom win their third round replay in Bristol next week it will be the third time in eight years that Posh have faced them in an FA Cup tie. West Brom were in the Premier League when they beat League One Posh 2-0 in the 2008-09 season in a third round replay at London Road. Posh had gained a creditable 1-1 draw at The Hawthorns thanks to a late Craig Mackail-Smith equaliser. Posh have only ever met Bristol City once in the FA Cup, in a third round tie in 1982, which City won 1-0 at London Road. 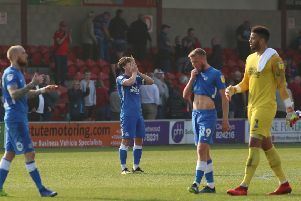 Posh haven’t reached the fifth round of the FA Cup since the 1985-86 season when John Wile’s struggling Fourth Division side lost 1-0 in a replay against Second Division Brighton at the Goldstone Ground. Dean Saunders scored the only goal of that game. The teams had drawn 2-2 in the first tie at London Road. The tie will take place on the weekend of 30/31 January. Posh were due to meet Oldham in a League One match on January 30. Local rivals Northampton Town were handed a potentially great draw. They will host reigning Premier Division champions Chelsea if they can win at MK Dons in a third round replay next week. Wycombe Wanderers or Aston Villa v Manchester City, Shrewsbury Town v Sheffield Wednesday, Nottingham Forest v Watford, Carlisle United or Yeovil v Everton, Crystal Palace v Stoke City, Oxford United v Newport County or Blackburn Rovers, Ipswich Town or Portsmouth v Bournemouth, Colchester United v Tottenham or Leicester City, Bury or Bradford City v Hull City, Northampton Town or MK Dons v Chelsea.